Edited by Barry Wright, Department of Law, Carleton University, Eric Tucker, Osgoode Hall Law School, and Susan Binnie, Independent Historian, published by the University of Toronto Press. This latest collection in our State Trials series, the fourth, looks at the legal issues raised by the repression of dissent from the outset of World War One through the 1930s and the Great Depression. Topics covered include enemy aliens, conscription and courts-martial in World War I, the trials following the Winnipeg General Strike, sedition laws and prosecutions generally and their application to labour radicals in particular, the 1931 trial of the Communist Party leaders, and the religious-political dissent of the Doukhobors. All regions of the country are covered, and special attention given in one essay to Quebec’s repression of radicalism. 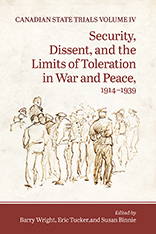 The volume focusses attention on older manifestations of contemporary dilemmas: what are the acceptable limits of dissent in a democracy, and what limits should be placed on state responses to perceived challenges to its authority.